Wheels and handles make transportation to the laundry room easier! Dorm Co. Tip: Laundry bag on wheels for ease! As a college student, trips to your dorm laundry room might not be so easy at times, especially those times when you've let your laundry pile up a little too high in your dorm room. When this happens, transporting your laundry from your dorm room to the college laundry room, a laundromat or back home to mom and dad's washer can be a real hassle. Some college laundry bags and dorm hampers make it too easy to spill your dirty laundry all over the place. Or, if your clothes aren't spilling all over the place, you could be exposing some pieces of clothing you'd rather not have everyone see on the way to the dorm laundry room. And do we even need to mention the struggle of a heavy dorm laundry hamper? Doing laundry is going to be a part of college life, but it no longer needs to be a hassle. 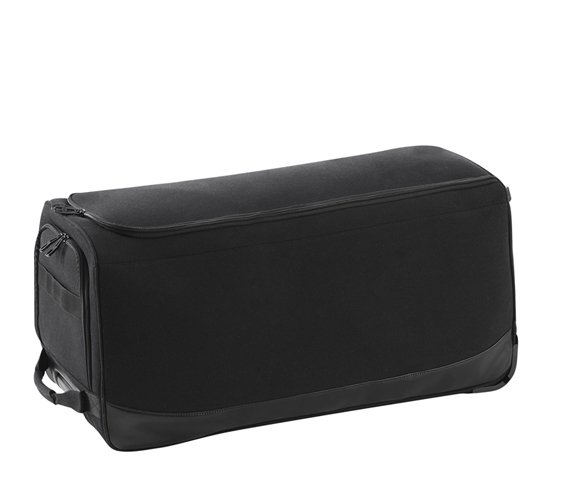 The Gomie - Duffle Laundry Bag with Wheels is here to make doing laundry easier and to save the day! This college essential is one dorm supply you don't want to leave home without. 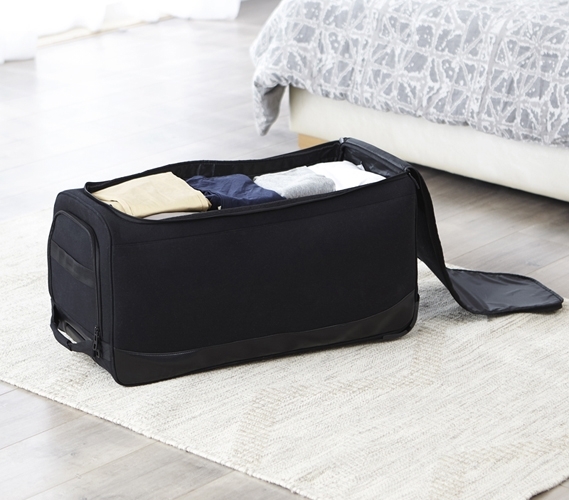 With so many exceptional features, this black spacious college laundry bag will make doing your laundry a breeze. 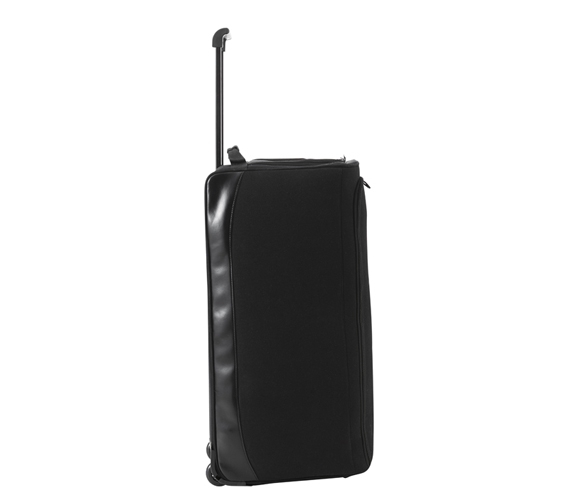 Everything about the Gomie - Duffle Laundry Bag with Wheels is designed to make your life easier. The most noticeable, of course, are the wheels! You no longer have to lug around a heavy dorm hamper if you've collected a sizeable pile of dirty laundry. Use Gomie's handle to wheel it around wherever you need to go, including steps! Your Gomie can be zippered shut, so no clothes fall out. Or, if you prefer, there is a handle on top and you can carry your Gomie down the steps. Because the Gomie is zippered, you don't have to worry about airing your dirty laundry. Besides covering up your laundry from your fellow college students or laundry mates, the (2) durable zippered openings of the Gomie serve another purpose. When Gomie is standing, the opening on top lets you throw in your dirty laundry like any other college hamper. Oh, there is also a strap included so you can secure that flap to the handle and out of your way. See, we weren't kidding when we said we wanted to make doing laundry easier. Once your laundry is done, you can open up the side zippered panel for easy access to lay your nicely folded clean laundry right in your Gomie. The durable zippers will ensure that neither of the zippered openings will split open on this spacious dorm room hamper. 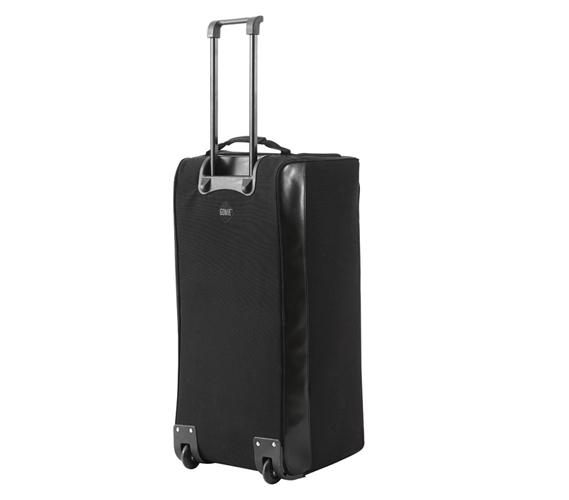 The Gomie - Duffle Laundry Bag with Wheels is the perfect college item and makes a great graduation gift! Dorm necessities like this portable college laundry hamper are best to have before you realize that you have to have it. Prepare yourself or your college student with a college college dorm room laundry bag that will make doing laundry so easy it won't feel like a chore.